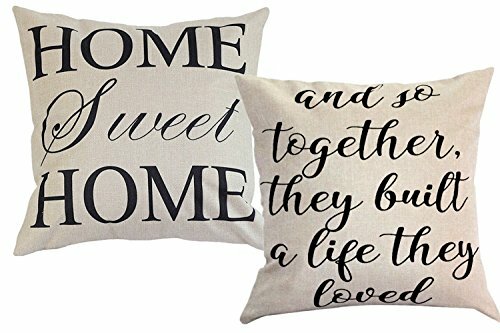 Foozoup Farmhouse Style Decorative Throw Pillow Case Cushion Cover 18'' x 18'' for Sofa Couch Home Sweet Home Cotton Linen and So Together They Built a Life They Loved by Foozoup at Wow In The Details. Hurry! Limited time offer. Offer valid only while supplies last. Feature 1. Size: Approx 18'' x 18''(45cm x 45cm). It fits an18x18 inch insert or smaller insert well be fine. 2. Material: grade cotton linen blend. 1. Size: Approx 18" x 18"(45cm x 45cm). It fits an18x18 inch insert or smaller insert well be fine. 2. Material: grade cotton linen blend. Printings never fade. 3. Pattern: only on the front side, the back is withoutprinting. 4. Package Include: Insert is not included, pillow coveronly. Printed with a special design, our decorative pillowcases issure to add flavor, texture and depth to your living space. Great addition toyour home decor, Create a comfortable living space for you. It applies toliving room; bedroom, offices, dining room, garden, and other relax space. Youcan also send gifts to friends and family Such as weddings, birthdays,graduation, teachers' gifts, grandparents, mother's day, and father's day. Order your favorite throw pillow covers today and add a touch of art to your lifestyle. We want you to buy with confidence anytime you purchase FOOZOUP products on Amazon.com. Made of 100% durable linen natural material, Fantasy Design, Nice Home Decor Style. This pillow cover has a Invisible and smooth zipper, Easy to insert just one Cushion cover, Pillow inserts are not included. A BEST GIFT - Our pillow covers make the perfect gift for: weddings, birthdays, graduation, teachers' gifts, grandparents, mother's day, and father's day. 100% SATISFACTION WARRANTY - every pillow case we make delivers premium quality and amazing workmanship. Plus, you get friendly customer service and 18-Month No Questions Asked Warranty. If you have any questions about this product by Foozoup, contact us by completing and submitting the form below. If you are looking for a specif part number, please include it with your message.